Adapalene cream, 0.1%, contains adapalene 0.1% in an aqueous cream emulsion consisting of carbomer 934P, cyclomethicone, edetate disodium, glycerin, methyl glucose sesquistearate, methylparaben, PEG-20 methyl glucose sesquistearate, phenoxyethanol, propylparaben, purified water, squalane, and trolamine. Absorption of adapalene from adapalene cream through human skin is low. In a pharmacokinetic study with six acne patients treated once daily for 5 days with 2 grams of adapalene cream applied to 1000 cm2 of acne involved skin, there were no quantifiable amounts (limit of quantification = 0.35 ng/mL) of adapalene in the plasma samples from any patient. Excretion appears to be primarily by the biliary route. Adapalene cream is indicated for the topical treatment of acne vulgaris. The trend in the Investigator's global assessment of severity supported the efficacy of adapalene cream when compared to the cream vehicle. Adapalene cream should not be administered to individuals who are hypersensitive to adapalene or any of the components in the cream vehicle. Certain cutaneous signs and symptoms of treatment such as erythema, dryness, scaling, burning, or pruritus may be experienced with use of adapalene cream. These are most likely to occur during the first two to four weeks of treatment, are mostly mild to moderate in intensity, and usually lessen with continued use of the medication. Depending upon the severity of these side effects, patients should be instructed to reduce the frequency of application or discontinue use. If a reaction suggesting sensitivity or chemical irritation occurs, use of the medication should be discontinued. Exposure to sunlight, including sunlamps, should be minimized during use of adapalene. Patients who normally experience high levels of sun exposure, and those with inherent sensitivity to sun, should be warned to exercise caution. Use of sunscreen products and protective clothing over treated areas is recommended when exposure cannot be avoided. Weather extremes, such as wind or cold, also may be irritating to patients under treatment with adapalene. Moisturizers may be used if necessary, however, products containing alpha hydroxyl or glycolic acids should be avoided. 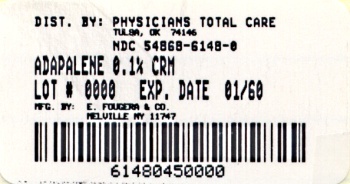 As adapalene cream has the potential to produce local irritation in some patients, concomitant use of other potentially irritating topical products (medicated or abrasive soaps and cleansers, soaps and cosmetics that have a strong drying effect, and products with high concentrations of alcohol, astringents, spices or lime rind) should be approached with caution. Particular caution should be exercised in using preparations containing sulfur, resorcinol, or salicylic acid in combination with adapalene cream. If these preparations have been used, it is advisable not to start therapy with adapalene cream until the effects of such preparations in the skin have subsided. Carcinogenicity studies with adapalene have been conducted in mice at topical doses of 0.4, 1.3, and 4.0 mg/kg/day, and in rats at oral doses of 0.15, 0.5, and 1.5 mg/kg/day. These doses are up to 8 times (mice) and 6 times (rats) in terms of mg/m2/day the maximum potential exposure at the recommended topical human dose (MRHD), assumed to be 2.5 grams adapalene cream, which is approximately 1.5 mg/m2 adapalene. In the oral study, increased incidence of benign and malignant pheochromocytomas in the adrenal medullas of male rats was observed. PREGNANCY: TERATOGENIC EFFECTS. PREGNANCY CATEGORY C.
No teratogenic effects were seen in rats at oral doses of 0.15 to 5.0 mg/kg/day adapalene (up to 20 times the MRHD based on mg/m2 comparisons). However, adapalene administered orally at doses of â‰¥ 25 mg/kg, (100 times the MRHD for rats or 200 times MRHD for rabbits) has been shown to be teratogenic. Cutaneous teratology studies in rats and rabbits at doses of 0.6, 2.0, and 6.0 mg/kg/day (24 times the MRHD for rats or 48 times the MRHD for rabbits) exhibited no fetotoxicity and only minimal increases in supernumerary ribs in rats. There are no adequate and well-controlled studies in pregnant women. Adapalene should be used during pregnancy only if the potential benefit justifies the potential risk to the fetus. It is not known whether this drug is excreted in human milk. Because many drugs are excreted in human milk, caution should be exercised when adapalene cream is administered to a nursing woman. Clinical studies of adapalene cream were conducted in patients 12 to 30 years of age with acne vulgaris and therefore did not include subjects 65 years and older to determine whether they respond differently than younger subjects. Other reported clinical experience has not identified differences in responses between the elderly and younger patients. Other reported local cutaneous adverse events in patients who used adapalene cream once daily included: sunburn (2%), skin discomfort-burning and stinging (1%) and skin irritation (1%). Events occurring in less than 1% of patients treated with adapalene cream included: acne flare, dermatitis and contact dermatitis, eyelid edema, conjunctivitis, erythema, pruritus, skin discoloration, rash, and eczema. Adapalene cream is intended for cutaneous use only. If the medication is applied excessively, no more rapid or better results will be obtained and marked redness, scaling, or skin discomfort may occur. The acute oral toxicity of adapalene cream in mice and rats is greater than 10 mL/kg. Chronic ingestion of the drug may lead to the same side effects as those associated with excessive oral intake of Vitamin A.
Adapalene cream should be applied to affected areas of the skin, once daily at nighttime. A thin film of the cream should be applied to the skin areas where acne lesions appear, using enough to cover the entire affected areas lightly. A mild transitory sensation of warmth or slight stinging may occur shortly after the application of adapalene cream. Store at controlled room temperature 68° to 77°F (20°-25°C), excursions permitted between 59° and 86° F (15° â€“ 30° C). Protect from freezing. Usual Dosage: Apply a thin film once a day at nighttime to affected areas. between 59° and 86°F (15°-30°C).